Before we left home, we had planned that the drive from New Iberia to Florida should be the longest on the whole trip, and it actually got even longer than planned, not least because we actually extended it in both ends. Originally, we had planned to drive from New Iberia to Tallahassee, Florida, but a couple of days earlier, we had agreed to continue all the way to Lake City to make it a little easier on me for my solo trip the following day. The day before we missed a visit to the Tabasco country store because of Independence Day. And as we both wanted to buy some of the specialties that can only be obtained there – or at least you can’t buy them in Denmark, we had decided to go there before heading east. We had noticed the day before that the store opened at nine o'clock so we decided to be there at that time, enter the store, buy what we needed, and then hurry off to Florida. When we arrived at the gate to Avery Island we were so early, that we were not allowed entrance until exactly 9.00 am, so we had to wait 15 minutes before we could even get onto the island. At 9.05 we stopped outside the country store, walked in, bought what we needed (we were well prepared so we did not go around browsing as we usually do) and at 9.15 we were on our way again! Because we did not browse and thus did not get tempted, it was not as expensive as it usually is when I'm in that store. I only bought one bottle of Tabasco Sauce in 12 oz. size, 2 bottles of Tabasco with Garlic, 1 Tabasco Chipotle, 1 Tabasco Buffalo and 1 Family Reserve Tabaco, all in 5 oz. bottles, and finally a Habanero Tabasco, in the usual 2 oz- bottle; the only size we can get for any kind of Tabasco in Denmark. There were several other things I could have bought, for example, Jalapeno Tabasco Sauce, Tabasco Sauce with Raspberries, Tabasco Chocolate, Tabasco Licorice, Tabasco Jelly and so on, and maybe even a new invention, a hot sauce made on Carolina Reaper chilies, until this year the strongest chili in the world* (produced for consumption and not just to see how strong they can get). The potency of the chili used for the sauce is an average of 1.5 million scoville (the measuring unit of pungency). In comparison, the otherwise strong habanero and scotch bonnet of about 200,000 scoville, a jalapeno are around 5-6,000 and a common tabasco chili of about 40,000. It was not the strength that kept me from buying, but more that I needed room for it in my suitcase, and Tabasco was not the only thing we bought along the way to take back home. This was the first of the two exciting places, mentioned in the header. * In 2018 the record was broken by another chili, Dragon's Breath, which is slightly stronger than Carolina reaper. So at 9:15 we left the store and 9.20 we also left Avery Island and returned to New Iberia. Along the way, we saw the same sugar cane fields that we always see, but this year we took time to take some pictures, which was the first time we did that. We saw even more fields as we headed south to the US Highway 90, which brought us through the southernmost part of the state. It might have been faster to go back to Lafayette and take I-10 from there, but it was definitely nicer on US 90. Somewhere along the way we turned north and we reached the I-10 near the New Orleans suburb Kenner, and apart from taking I-610 around New Orleans, we stayed on this interstate for the rest of the day, at least until we reached Lake City. By taking I-610 instead of I-10, you save approx. 3 miles, but a bit more time as there is a lot of traffic on I-10. Well on the other side of New Orleans we headed for the Mississippi state line, and along the way we passed the bridge that crosses the eastern part of Lake Pontchartrain. We have driven this trip before and each time we have returned to US 90 as soon as we were in Mississippi but this time we stayed on the interstate. The route through Mississippi is only about 75 miles and on this stage we made no stops at all. In Alabama, the route is even shorter, only 65 miles, but here we did make a stop. We passed Mobile, where the highway partly leads through a tunnel under the Mobile River and shortly after leaving the tunnel, you are passing a fairly long bridge over several rivers that end up in the northern part of Mobile Bay. Along the way, you pass the USS Alabama, a WWII battleship, which today serves as a museum, but we did not have time for a visit on this occasion. 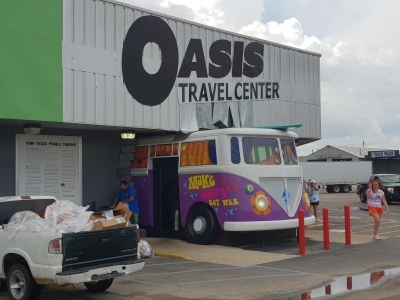 Oasis Travel Center in Alabama, entrance though half a minibus. A little after Mobile you find an interesting gas station and truck stop, Oasis Travel Center, which we had visited in 2016, and we decided to make another stop here, to have a little something to eat and a cup of coffee, and just to take a break. You enter the store, which is quite large, through half a VW minibus, and inside there are several eating opportunities, shopping and much more and the cashier’s area is decorated like a small pirate ship. Outside there are various buses and railway cars that are arranged as seating for the eateries. A rather exciting place, which is the second of the two that the headline refers to. After a stay of approx. 30 minutes here we returned to the interstate and proceeded to Florida. We had filled up the car with gasoline before we left New Iberia, but today's stage was so long that we had to refill shortly after we had passed the Florida state line in Pensacola. Then we continued through (or rather around) Tallahassee and on to Lake City without further ado. We found (using the gps) a hotel a bit south on I-75, and we had no trouble getting room, even though it was the day after the holiday. When we arrived, it was around 8 pm, but we had also “lost” an hour along the way. We also had done the same on two previous occasions on this trip, and both times in connection with long drives. I do not know why, but we do that almost every time we have to cross between time zones. We have to get better at planning these things. But now we were on east coast time, so we would stay in that time zone for the rest of the vacation. Like in New Iberia, there was also a Ruby Tuesday next to the hotel, so we just had dinner there. As we didn’t have to drive home, we actually had a drink before dinner, a mojito for each of us, or at least some kind of mojito. They announced that they were out of mint, but we accepted it anyway, and it was drinkable even without the mint. It had been cloudy most of the day, but no rain. At least not until we reached Florida, The Sunshine State, where we were hit by a severe thunderstorm, which lasted for about 30 minutes, then it stopped and when we reached Lake City the sun shone through the clouds. Today's stage ended up being the longest we had driven in the United States so far, 625 miles. The closest to that was a trip from Ferguson in North Carolina to Raritan in New Jersey in 2012, but that drive was "only" 604 miles. The following day we would split up, at least for some time. Tim would stay in Flagler Beach with his good friend (not that kind of friend), Lexie and her parents while I would go north to visit my favorite part of the United States, western North Carolina and some of the people I know there. But first we had to get to Flagler Beach, a 130 miles trip from lake City. In order for me to reach as far north as possible, we got up early and left the hotel at around. 8.00. We headed back to the I-10 and took this east to Jacksonville, Florida's largest city. Here we changed interstates to I-95 south to Flagler Beach. It was a drive that would take us approx. 2 hours, and when we got to Flagler Beach, but before we drove out to where Lexie lives, we refilled the car so it was ready for my continuing drive north. Lexie and her parents live two roads from the beach itself, and we found the place easily enough. We had planned on being there around 10, and it was 10 minutes past when we arrived. Tim was well received by Lexie's parents who promised to take good care of him until I returned :-). At 10.30 I was on my way again and headed north, once more on I-95, but now in the opposite direction. I had to stay on this highway through Florida and Georgia to around Charleston in South Carolina, where I switched to I-26. My plan was that I would stop for the night in Columbia, the state capital of South Carolina and find a hotel there. Since I did not know exactly how far I would drive, I had not booked a hotel and it turned out to be a good idea. The drive went smoothly except for various roadworks, not least around Jacksonville, Florida, Savannah, Georgia and Charleston, South Carolina and it rained all the way through Georgia, but stopped when I reached South Carolina. After having turned northwest on I-26 it was just to continue to Columbia. When I reached Columbia, traffic stopped and there were quite long lines of traffic moving very slowly or stopping completely from time to time. On the other hand, it was only 4.30 pm, so I decided just to find a gas station and fill up the car once more and then continue just a little bit longer. 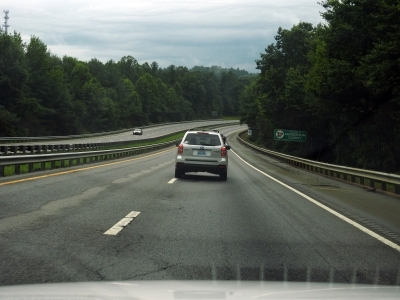 There were several smaller towns along the way north where I could stay overnight, and I-26 also passes Spartanburg, which is a rather big city with over 300,000 inhabitants in the so-called metropolitan area). As I reached the various small towns with their hotels and motels at the highway exits, I told myself each time that I would keep going just a little bit longer, and when I reached Spartanburg, it was still not that late, so now I decided that I might just as well continue to the small town of Tryon just across the North Carolina state line, so I did. If someone remembers the Heading East article (if you do not, just read it again), you will remember that in Las Cruces I bought an adapter so I could charge various devices, such as cell phone, tablet, cameras, etc. Somehow, however, I already managed to lose this adapter again, which I had discovered the day before in Lake City. Whether it happened in Abilene, Bonham or New Iberia, I don't know today, but as I was no longer with Tim and able to use his adapter, I had to buy a new one. When I reached Tryon, I searched for the address of a Walmart where one could be obtained, but unfortunately there was absolutely no Walmart in Tryon. In fact, the one closest to my present position was in Hendersonville, another 20 miles to the north, so I continued. At that moment, it started to rain once more, and it continued for the rest of the day and evening, but fortunately only as a drizzle when I had to leave the car. I did find a Walmart and bought the adaptor and this one I managed to hold on to for the rest of the trip and it is now ready for my next visit to USA. I now have four of these adapters, so if I bring all of them along for next year's trip, there's a chance that one of them will survive the whole trip. After visiting Walmart I found a hotel - or rather I decided to stay at the same hotel as the whole family stayed in on our very first visit to the US back in 2000. It was a bit on the expensive side as it was late and I just had to sleep, actually it proved to be the second most expensive accommodation on the whole trip, only our hotel in Miami was more expensive, but there we were two to share the expenses. Even the B&B's I stayed in was not that expensive. On the other hand, I was allowed to bring a pet, so I actually thought of buying a dog, just to have some animal to bring along. Only kidding! At the hotel there is a Mexican restaurant, and here we had dinner in 2000, and here I chose to eat again. Once more I could walk my room, which was just opposite the restaurant, (around 50 feet or so) so once again I went for a drink before dinner, this time in the form of a margarita. What I ate I have forgotten, but it was not too expensive. Food and drink including the margarite was only $ 27. Did I forget to tell you, it was happy hour? That meant my margarita was half price. When I had completed todays drive, it turned out that I had driven even further than the day before, 630 miles including the trip from Lake City to Flagler Beach, and of these I had driven exactly 500 miles alone in the car. So the two-day deployment from New Iberia to Hendersonville, North Carolina via Flagler Beach, Florida ended up being 1,255 miles. Well done I think, for a couple of guys from a country, where the distance between the southernmost and the northernmost town is only 340 miles and even shorter between east and west (at least if you except the small island of Bornholm, where you have to go by ship or plane anyway).